Scotchman | R.J. Kates Co.
Scotchman Industries, Inc. is a leading manufacturer of metal fabrication equipment, accessories, and custom tools. From general to heavy-duty metal fabrication to farm use, shipbuilding, technical schools, the U.S. military, Fortune 500 companies, and the one-man hobby garage shop, Scotchman has been the preferred solution for our customers for nearly half a century. 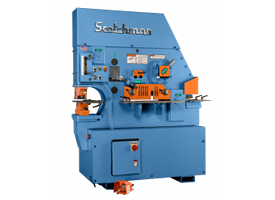 Scotchman manufactures 13 models of Hydraulic Ironworkers, ranging from 45 to 150 tons, in three distinct styles. 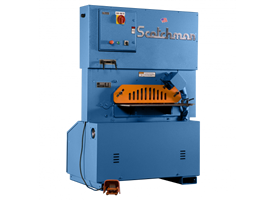 Along with the complete line of hydraulic ironworkers, Scotchman Industries offers a full line of manual to fully-automatic Circular Cold Saws, including pivot and column designs for ferrous and nonferrous applications. 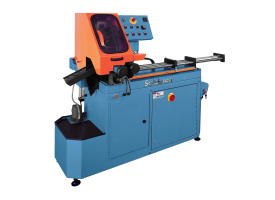 Scotchman is also the North American importer of ALMI Tube and Pipe Grinder/Notchers. 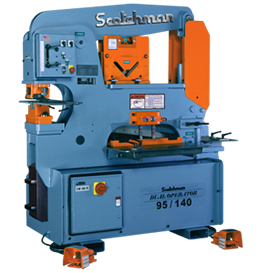 These coping machines are available in three styles: manual, electric, and abrasive grinder notchers. If you need a high production shearing machine, the Scotchman ShearMaster 610 is a heavy-duty 24″ plate shear with a large capacity and works well with our programmable stop feature, the Scotchman Advanced Feed System. Their line of Measuring Systems include: a manual, Advanced Measuring Systems, guaranteed not to slip and can be adapted to almost any type of metal or woodworking machinery; a Programmable Stop Systems can be used as a fully automatic feed system or as a programmable “go-to” stop. These systems allow you to increase productivity, decrease set-up time, reduce operator error and eliminate waste.